High voltage is found in a wide variety of places including power distribution networks, components that detect light or particles (for example photo-multipliers and electron multipliers), components that emit light or particles (such as halogen globes, and cathode ray tubes), transformers, high powered receivers and transmitters, automotive ignition systems as well as in a variety of natural occurring phenomena like lightening and objects that exhibit electrostatic behavior. The use and study of high-voltage is important as it is crucial to the understanding how electricity can be transmitted, a key parameter in power distribution, as well as how components perform under different conditions. Spectrum digitizers are ideally suited for use in high voltage test systems as they are available with a wide range of sampling rates, bandwidths and resolutions. For example, high voltage impulse testing typically requires large dynamic range and maximum sensitivity. Spectrum offers high-resolution 14 and 16 bit digitizers that can capture and analyze signals that have frequency content going as high as 250 MHz. These high-resolution cards deliver outstanding signal-to-noise ratio's (up to 72 dB) and spurious free dynamic range (of up to 90 dB) so that the smallest signal variations can be detected and analyzed. Furthermore, they have fully buffered front-end circuitry and calibrated gain ranges making it easy to adjust the full scale input range to match the signal being measured. For even higher frequencies 8 bit digitizers are available that offer up to 5 GS/s sampling rates and 1.5 GHz bandwidth. The digitizers are available in a number of form factors including PCI, PCIe, PXI and LXI. The PCI and PCIe cards can be installed directly in a desk top PC while the LXI instruments can be used with a Notebook or anywhere that you can connect to a local area network (LAN). With large on-board memories (up to 4 Gsamples/card) and advanced streaming and readout modes the digitizers are ideal for capturing long and complex signals. Streaming data from the digitizer to a storage system also allows the archiving of hours of information. Spectrum's SBench 6 software can provide full instrumentation control as well as an easy way to view, store and qualify signals. FFT's are available for frequency domain analysis and parametric calculations can be used to measure key signal characteristics like amplitude, slope, pulse width and more. 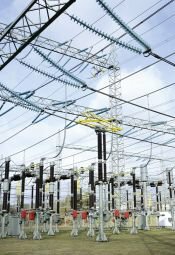 Using an antenna array for non-contact Partial Discharge (PD) detection has become a useful technique for in air-insulated substation (AIS) monitoring. At the State Key Laboratory of Electrical Insulation and Power Equipment, School of Electrical Engineering, Xi’an Jiaotong University, Xi’an, China, they are using two synchronized Spectrum M4i.2221-x8 digitizers to simultaneously collect signals from four antenna at a sampling rate of 2.5 GS/s. The white paper here shows time difference localization techniques and how they can be classified as maximum-likelihood (ML) and least squares (LS) estimators.